Everyone has a good word for this book: Liz liked it, Rachel thinks it’s probably the most gripping book she’s read this year, Martin thinks it’s the best effing science fiction novel he’s read all year, Frank Cottrell Boyce thinks it is fantastic, and it’s already won this year’s Guardian Children’s Fiction Prize and Booktrust Teenage Prize. So at this point it’s probably very nearly redundant for me to say I like it too; but here goes. I like it. — is revealed to be a lie. As just about every one of the commentaries I linked to above notes, Ness’ control over his dripfeed of information is so good that it’s a bit unfair to tell a naïve reader much about the story. In nearly every encounter you learn something new about Todd’s world, and almost all of the revelations are interesting enough to distract you from the fact that they’re usually not what you went into the scene wanting to learn. (The success of this tactic is perhaps lessened a bit if you read it in one sitting.) And then the next scene starts. As Todd puts it at one point, “the world keeps getting bigger” (100); his story is driven by expansion. But if it’s pace that made me want to read The Knife of Never Letting Go, it’s voice – and the consequent emotional weight that accretes behind the runaway train of narrative – that makes me want to re-read it. This is where the Noise comes in, which is just what Todd says it is in that quote above: the thoughts of men shoved out into the world. Before too long, it becomes apparent that one way of describing what we’re reading in this book is to say that it’s Todd Hewitt’s Noise. He is stripped naked before us — and before anyone else who happens to be listening. This is a book which feels immediate and unfiltered, rough-edged; Todd’s joy and pain, however fleeting, are our agony. At times, under intense pressure, Todd’s narration becomes fragmentary, or entirely lost in the babel that surrounds it. This allows Ness to get away with some narrative cheats — there are several key pieces of information which Todd glimpses in the Noise of others early on, but refuses to accept, which means they’re withheld from the reader until he’s ready to face them, at nearly the end of the book — but it also means the manner in which he’s telling his story (i.e. prose) becomes inextricable from that story, which seems a fair trade. That what is being unfolded in the course of the story happens to be science-fictionally interesting is a happy bonus. Noise, for example, can’t be ignored, but also can’t be trusted. “Noise ain’t the truth”, Todd reminds himself at one point, it’s “what men want to be true, and there’s a difference twixt those things so big that it could ruddy well kill you if you don’t watch out” (23). In Prentisstown, which Todd believes to be the last town on the planet, Noise is peer pressure, monsters from the id, information overload: all of this and more. The implications and possible variations of Noise continue to be developed throughout the novel — dogs and sheep are sort of eagerly dumb, for instance, while some of the native fauna make more creative use of Noise — but the first and most elaborated variation flows from the first truth that Todd uncovers, that there are still women in the world. One of the few things Todd is right about, in his initial understanding, is that women don’t have noise. Ness treads a fine line with this, repeatedly leaning towards literalising a hoary cliché, only to upset things later in the novel. Shortly after fleeing his all-male home — for reasons that don’t need exploring at this juncture; save to say that the enemy chasing him is appropriately chilling — Todd encounters a girl called Viola. When he first perceives her, from a distance, as a silence, he finds her cooling and soothing; and he (sort of) rescues her from one of the nastier townfolk. However, although Viola is (initially) strangely silent, she is impressively self-possessed; she fairly quickly decides that Todd is a bit useless, hits him with a big stick, and starts walking back to where she came from. Of course, things between them do improve from there, and in fact one of the joys of the book is watching the relationship between the two of them develop, not least because it doesn’t become romantic — although in the promised sequels I imagine that’s unavoidable — but it’s apparent that Viola is rather more with-it than Todd. (During the reading week, a number of people read this book; and one of them explained that he liked it a lot more once he realised Todd was a bit of a twit, and switched his mental identification to Viola.) Other cliches played with: initially, Todd is frustrated because he (literally) can never tell what Viola is thinking (so the connection between the two of them is ultimately all the more powerful for existing independently of Noise); and the emotional incontinence Noise causes in men is used to good effect. All of which, perhaps, is merely to say that for all that The Knife of Never Letting Go looks straightforward, it is not. 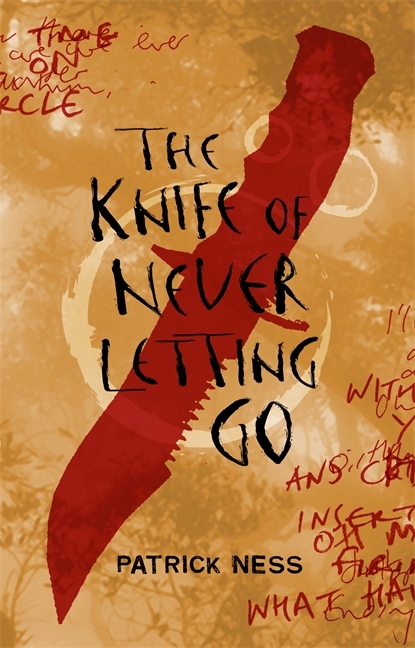 Hidden within its Allen-Steele-style-colonization exterior beats a darker, Tiptree-ish heart and, an odd timidity about swearing aside, The Knife of Never Letting Go rarely disappoints. Rather, it develops its premise with consistent wit (“he hears me looking”, Todd thinks at one point), not a little charm, and absorbing thoroughness. It is fast to read, and intense; channelled Noise. As everyone else has said: roll on The Ask and the Answer.